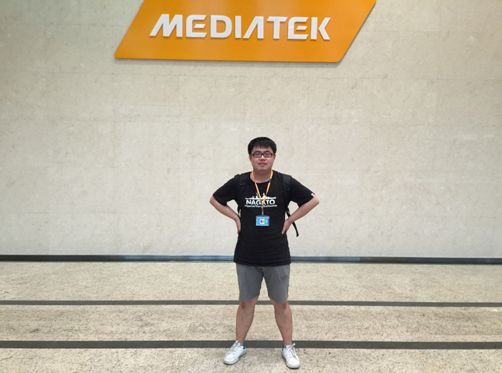 It has been more than 2 months since my internship starts in MediaTek, and quite an impressive experience it really is. Not only have I learned more about the latest knowledge in my major, but also I’ve learned what a modern high-tech corporation is like, how it feels to work in it, and how one should communicate and cooperate with others in a team. And I feel MediaTek is really a great place to work. The working environment is nice, the canteen is good, and the regular bus line is rather convenient. More importantly, I find my colleagues here are young and kind and willing to help, which helps me blend in smoothly. There are also activities after work or in the weekends so MediaTek is really a place full of passion and life. In my internship, I would like to thank my mentor Feifei Sun, she gives me quite a lot of suggestions in my job, and her help to me in other aspects is appreciated so much as well, her help makes me transfer from a student in a college to a “semi career man”. I also want to thank Xiangai Wang, my schoolmate who also works as an intern in the corp. The internship in Mediatek is a remarkable experience in my life and I think it will help a lot in my coming career life.